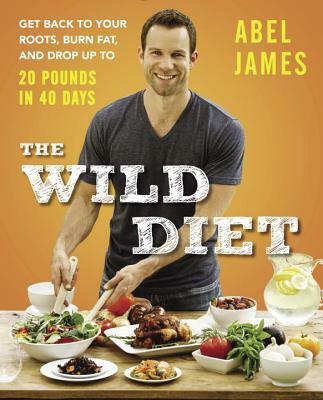 Abel James, the ABC star and creator of the #1 Fat-Burning Man Show, shares his revolutionary weight-loss program in The Wild Diet - now a New York Times Bestseller! Can you really lose 20 pounds in 40 days while enjoying real butter, juicy burgers, chicken parmesan, chocolate, and even cheesecake? In The Wild Diet, you’ll find that we are not meant to starve ourselves, count calories, or avoid delicious food. We’re wired to eat luxuriously and live well without getting fat. If you think that you’re stuck with the genes you inherited and there’s nothing you can do about it, read closely. The Wild Diet paints a different picture, one in which we have the power to influence our genetic expression by taking control of the quality of food we eat, the way we move, and the environment around us. We once had access to an immense variety of fresh seasonal foods from small, local sources. Now we have access to few varieties of processed foods from a massive industrial system often thousands of miles from where we live. The secret to great health simply getting back to our wild roots and enjoying real, Wild foods grown on a farm and not in a factory. By prioritizing foods found in the natural world, rich in fiber and nutrients, your body will burn fat instead of sugar for energy. When you reduce your consumption of processed grains, sugars and other simple carbohydrates in favor of healthy plants and animals, you will be shocked by how quickly you can reverse the damage of decades of poor eating. The Wild Diet proves that it’s possible to get in best shape of your life while eating delicious foods like chicken parmesan, bacon cheeseburgers, and even chocolate pudding. If you want to know how to burn more fat by indulging in incredible meals and exercising less, it’s time to treat yourself to The Wild Diet. Abel James lives in Austin, Texas. “In The Wild Diet, Abel shatters conventional wisdom and gives us the truth about what it takes to be lean and healthy without obsessing about what we eat. There's a reason Abel’s Fat Burning Man show has become #1 in 8 countries and I have no doubt that The Wild Diet will be just as well received. Abel’s message is simple, pragmatic, and can get you lasting results in less time and with less effort than you’d probably expect. “When I found myself overweight and struggling with my health despite doing my best to follow all the current dietary dogma of the day, I started seeking some alternatives. Somehow I landed on a podcast called "The Fat Burning Man Show." The host, Abel James, was telling his story and it sounded like he had peaked at my diary. Everything he spoke about resonated with me. I began incorporating the principals of The Wild Diet into my own life and fifty pounds later, I'm a different man.